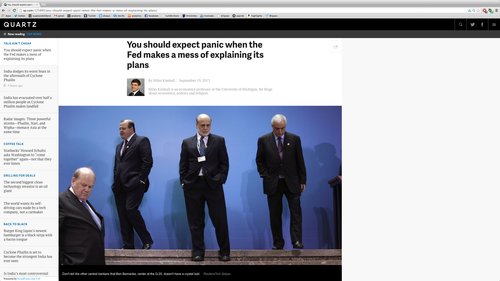 Here is the full text of my 31st Quartz column, “You should expect panic when the Fed makes a mess of explaining its plans," now brought home to supplysideliberal.com. It was first published on September 19, 2013. Links to all my other columns can be found here. © September 19, 2013: Miles Kimball, as first published on Quartz. Used by permission according to a temporary nonexclusive license expiring June 30, 2015. All rights reserved. If the incoming data are broadly consistent with this forecast, the Committee currently anticipates that it would be appropriate to moderate the monthly pace of [asset] purchases later this year. the markets have been convinced that the Fed intends to continue to use the “quantitative easing” provided by buying long-term government bonds and mortgage-backed assets to stimulate the economy until things look better. I agree with Justin Wolfers, writing in Bloomberg, that the way Bernanke talked in June about “tapering” off asset purchases was a serious mistake, only partly rectified by the Fed’s announcement today. But the real fault lies with an approach to monetary policy that relies so heavily on communicating the Fed’s future intentions. Monetary policy’s dependence on what the Fed calls “communications” is problematic because members of the Fed’s monetary policy committee don’t even agree on what war they are fighting. Some view the battle as one of fighting back from a close call with the possibility of another Great Depression. Janet Yellen, the clear frontrunner to succeed Ben Bernanke now that Larry Summers has bowed out, is in this camp. Some just want to make sure monetary policy doesn’t contribute to another financial crisis. Still others worry about avoiding the inflationary mistakes of the 1970s. It is hard for a many-headed beast to signal a clear direction. Secondly, the Fed’s approach of talk therapy is problematic because it is hard to communicate a monetary policy that is strongly stimulative now but will be less stimulative in the future. As I discussed in a previous column and in the presentation I have been giving to central banks around the world, adjusting short-term interest rates has an almost unique ability to get the timing of monetary policy right. Unfortunately, the US government’s unlimited guarantee that people can earn at least a zero interest rate by holding massive quantities of paper currency stands in the way of simply lowering short-term interest rates. Without being able to cut short-term rates, the two choices left are (a) stimulative both now and later or (b) not-so-stimulative either now or later. Since the appropriate level of monetary stimulus now and a year or two from now are likely to be different, it is easy to see how the Fed’s thinking—and the market’s interpretation of the Fed’s thinking—could oscillate between focusing on getting the right level of monetary stimulus now, and getting the right level of monetary stimulus later. Eliminate the zero-lower bound on nominal interest rates—or at least begin making the case to Congress for that authority. Develop a more rule-based approach to monetary policy focused on the level of nominal GDP in which (aside from urgent crises like that in late 2008) the role of “judgment calls” would be limited primarily to judgments about the highest level of output consistent with avoiding a permanent increase in inflation. Such an approach would allow the Fed to speak with a more unified voice despite disagreements among members of the monetary policy committee. Deal with financial stability by raising equity requirements for banks and other financial firms rather than thinking that tight monetary policy is the key to financial stability.